Though it has been the pillar of China’s economic growth for decades, the real estate industry’s long-term potential has come under questioning recently. As old-fashioned modes of conducting business get more and more outdated amid economic reform, various theories about how the real estate industry can transform itself in this era are still far from clear. But through rational and objective analysis, the evidence still shows us that the sector will continue to play a significant role in China’s economic structure for years to come. The difference, however, is that only by innovating and enhancing business approaches to match this changing era can real estate firms survive into the future. Caixin Global will hold its 2017 New Economy, New Merging, New Growth: Trends in China’s Real Estate Industry forum, aiming to discuss in-depth how should the health, energy, technology, internet, and finance industries should cooperate with the real estate industry for successful structural reform in this new economic era. Unlike conventional real estate talks, this forum will mainly focus on cooperation with emerging industries such as technology, energy, and health. New economic conditions and their corresponding policies require companies to possess an active mindset and a resolution to implement transformative measures, in order to achieve multi-industry cooperation and diverse growth. Meanwhile, by using the Caixin NEI data platform, the Trends in China’s Real Estate Industry Review will also be released, and we welcome your presence to witness this historical moment together. Deputy General Manager and Managing Director, Huajing Security Co., Ltd (under China Renaissance). We are fueled by China’s most influential financial media group, Caixin Media, and its unrivaled newsroom. We serve global businesses and professionals who have interests in the world’s second largest economy. We deliver credible business and financial news, information, insights and data. We power critical decisions, move markets, discover truth, and we make sure you don’t miss a vital story on China. The report will be based upon a series of factors including market research and interviews with professionals and business leaders, while considering the political and economic trend both domestic and abroad. It aims to provide critical and in-depth analysis about the challenges and opportunities Chinese industrial real estate companies may face under the new economic conditions. 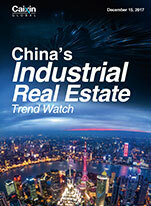 Also, it offers a future development trend outlook for Chinese industrial real estate sector with unique perspective, supporting both the government and companies to make precise judgement for the future. Editorial: Over-Optimism Mustn’t Derail China’s Reform Push as Economy Warms Up. There are diverging forecasts on China’s economic outlook.